There are two versions of products for pulp and paper application: cationic (SUNCOS-PG products) and nonionic (SUNTECH-PG products) to suit different applications in paper manufacturing. SUNCOS-PG and SUNTECH-PG are a range of specialty polymers for paper industry which are natural and chemically modified derivatives of guar gum. These products are especially developed to impart different performance functions in various kinds of papers like newsprint, magazine, cigarette, packing etc. The pulping process in paper manufacturing, which is designed to remove lignin and produce a fibrous cellulose pulp, also removes large parts of the hemicelluloses normally present in the raw material. SUNCOS-PG and SUNTECH-PG products replace or supplements the natural binding material needed in the paper bonding. One of the important properties of SUNCOS-PG and SUNTECH-PG products is their hydrogen bonding effect, an effect which is known to be one of the major factors affecting fibre-fibre bonding. SUNCOS-PG and SUNTECH-PG products mostly used dilute solutions in the paper making process. 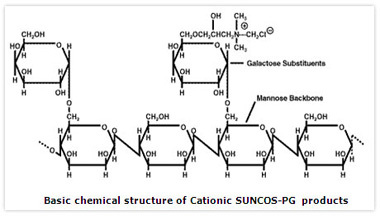 SUNCOS-PG products are cationic in nature; cationic grades are manufactured by reacting guar gum with a quaternary ammonium compound to obtain Guar hydroxypropyl trimonium chloride. Nonionic SUNTECH-PG products are native and modified guar gum powder for specialty paper manufacturing to be used in size press applications and as wet end additives. SUNCOS-PG products are available in varying viscosities, nitrogen content, particle charge density and dispersing properties. SUNTECH-PG products are available in varying viscosities, dispersion properties and particle sizes. Customized products can also be provided as per specific needs. Detailed specification sheets are available on request.